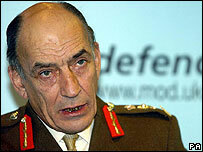 The former head of the British army has called on the government to maintain military hospitals. In an interview on BBC Two's Newsnight, Sir Mike Jackson said personnel were "better off" in dedicated facilities. Seven of the eight military hospitals have closed since a Tory government review in the early 1990s and the last in Haslar, Hants, will shut in 2009. The government says military hospitals cannot match NHS specialised care which provides "top-quality treatment". Sir Mike told Newsnight: "Soldiers who have been wounded, psychologically are far better off one with the other in the same ward under a military environment. "That's their life, that's what they respond to. This is not easy to achieve under the present arrangements." Asked if he thought it was a mistake to close military hospitals, Sir Mike said: "I'm afraid I do." But he acknowledged the decision was taken at the end of Cold War and was based on clinical needs. He said his opposition to the closure of military hospitals had always been "more of principle than of numbers". "We ought to make a better effort to give soldiers who are wounded in the course of their duty, care and rehabilitation within the military environment if at all clinically possible," he said. Sir Mike's comments came after some veterans told Newsnight they did not feel they received adequate treatment at NHS hospitals. A military-managed ward has recently been set up at Birmingham's Selly Oak Hospital. But Veterans Minister Derek Twigg said there were no plans to re-establish military hospitals. He said: "There isn't the (military) population now to justify military hospitals to ensure that our clinicians and nurses get the training and development they need to maintain skills that are needed today to treat and care for the injured service people." He said there were military managers at every level of the NHS and an increasing number of military nurses. He said soldiers and their families had talked very highly of treatment and care at Selly Oak. "I'm very clear that in the operational theatre and places like Selly Oak our personnel are getting world class and top quality treatment," he added.